The JET-MIX® is mounted at an adjustable angle in the water with the motor portion and air intake above the surface. The motor rotates, turning the hollow shaft which turns the propeller. This pushes water at a high velocity through and near the propeller blades, creating a partial vacuum at the end of the shaft. Atmospheric air above the waterline is drawn in through the air intake port and into the hollow shaft. Turbulance and flow created by the propeller breaks up the air bubbles, mixes the basin and disperses oxygen. The horizontal water movement maximizes bubble hang time maximizing oxygen transfer. * Specifications subject to be changed without notice. The JET-MIX creates strong horizontal mixing rather than the other aeration system. In wastewater treatmentm the effectiveness of the aerator to disperse oxygen and maintain solids in suspension thereby, increasing bacteriological breakdown, eliminating stagnant spots and controlling odors. The JET-MIX turbulent, horizontal flow greatly extends bubble hang time, allowing oxygen to freely and quickly transfer into the water. 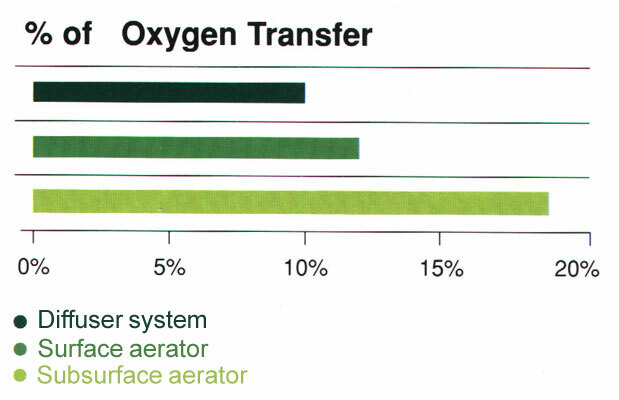 This is to create higher oxygen level than other systems. The JET-MIX doesn't have to overcome the force of gravity to throw water up into the air, and therefore, is capable of saving at least 1/3 of the horsepower required by other system.